Ultra Kermit Fighters: Dark Edition is a 2.5D Fighting Game where Kermit faces off against his darkest desires. 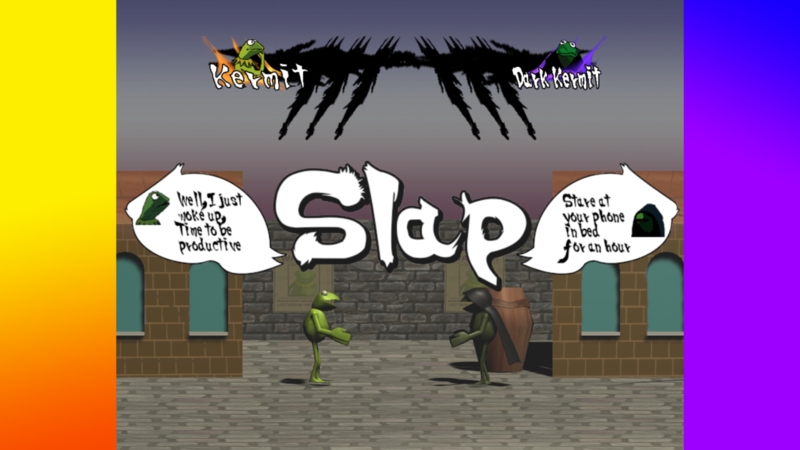 This game is based off the Kermit meme where Kermit is tempted by a cloaked version of himself. 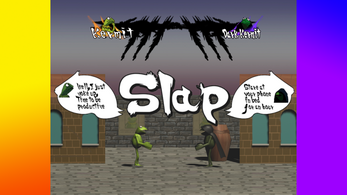 Players take on the role of either Kermit or Dark Kermit and try to slap each other to see who gives in. This meme was interesting because it's all about resisting temptation, which our game reflects because giving into temptation in battle might not prove the best strategy. 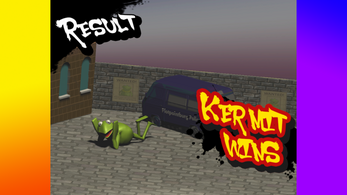 The easiest things to do in Ultra Kermit Fighters: Dark Edition simultaneously were the hardest things to do. We got a basic working version of the game pretty quickly, but actually implementing all the features proved difficult. Each individual component of a mechanic was not hard, but putting all of the components together into a polished mechanic definitely was hard. Our game utilizes a lot of different systems in Unity such as collision detection, physics, particle effects, animators, UI, more.